Swire’s story begins with a young man setting off to seek his fortune as a result of family bankruptcy. While this is not a classic rags-to-riches tale, resilience in the face of adversity was a characteristic that was to stand the firm he founded in good stead on more than one occasion over the following 200 years. The following article was written by Robert Nield, and first published in the Dictionary of Hong Kong Biography, edited by May Holdsworth and Christoher Munn. The publisher, HK University Press, has kindly granted permission for it to be posted here. Swire, John Samuel b. 24 December 1825, Liverpool, England; d. 1 December 1898, London. Merchant, shipowner. Swire, George Warren b. 29 May 1883, London; d. 18 November 1949, London. Merchant, businessman. 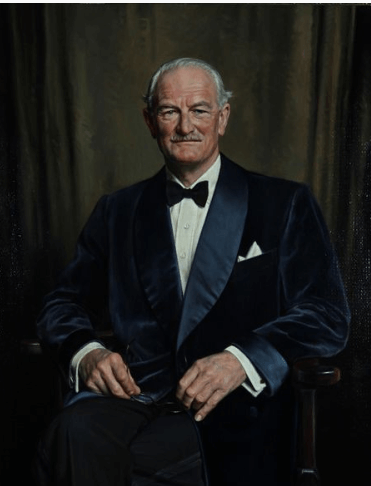 Swire, John Kidston b. 19 February 1893, England; d 22 February 1983, England. Businessman, entrepreneur. “The name ‘Swire’ was a latecomer among the foreign businesses on the China coast. By the time the firm arrived in Shanghai, the market was dominated by Jardine, Matheson & Co., Dent & Co., and Russell & Co. Swire outlived the latter two and remains a major commercial power in Hong Kong, China and the region. 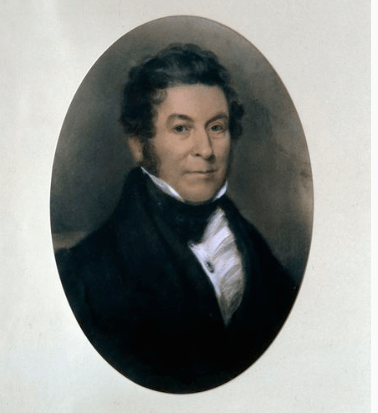 John Swire (1793-1847), descendant of a Yorkshire family of landowners and wool merchants, founded an import-export business in Liverpool, trading in textiles, in about 1816. In 1832 he created the firm John Swire & Sons (JS & S) and passed equal shares on his death to his sons John Samuel and William Hudson (1830-84). John Samuel had an adventurous streak. In 1849 he spent five months travelling the American West, and in 1854 he sailed to Australia to work at the gold diggings. He opened a branch of the business in Melbourne but returned to England where his younger brother was having difficulty managing without him. On 15 November 1859 he married Helen, daughter of a prosperous Liverpool sugar refiner Adam Fairrie. Helen died at sea in 1862 whilst on holiday, leaving a son John (1861-1933). John Samuel Swire reacted to his wife’s death by retreating into his business with increased energy, importing cotton from America and exporting British goods to Australia. Following the disruption to the cotton industry brought about by the American Civil War, he travelled to Shanghai in November 1866 to investigate the China market. Within a week he had established a partnership with Richard Butterfield (c.1808-79) and set up Butterfield & Swire. The partnership was dissolved in 1868, at Swire’s suggestion, but the name remained and an auspicious Chinese soubriquet was added – Taikoo (‘Great and Ancient’). In 1867 John Samuel, in the belief that the business was sufficiently established, moved himself and his headquarters to London. At the time he described himself as an ‘East India Merchant’. He bought out his brother’s share in 1876. John Samuel believed in networking, and one of his closest and most successful colaborations was with Alfred Holt, Liverpool founder of the Blue Funnel Line. 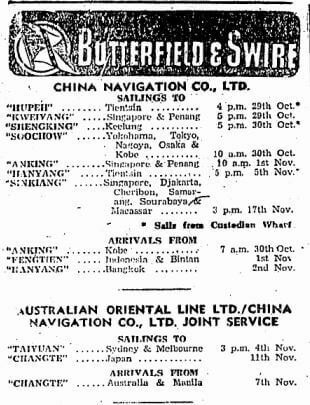 Through this association Butterfield & Swire strengthened its own shipping activities with its China Navigation Company, formed in 1872, becoming the largest shipping operator on the Yangtze River. John Samuel Swire was the initiative behind the ‘shipping conferences’ that were established in the 1870s to regulate competition among shipowners and operators; he believed that there was enough of a market for all to have a fair share of it. John Swire & Sons had by now shifted the focus of its business to the Far East, opening branches in Yokohama in 1867 and Hong Kong in 1870. Many more would follow, as would new businesses, such as the Taikoo Sugar Refining Co. in Hong Kong in 1882. Located on land the company bought at Quarry Bay, Taikoo Sugar became one of the most important industries in Hong Kong. Given Swire’s shipping interest, it was only logical that it should have its own base for shipbuilding and repair. 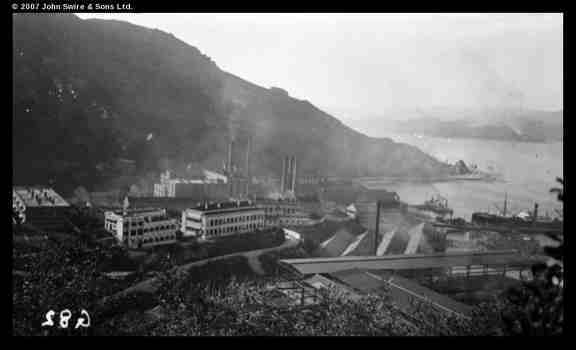 The Taikoo Dockyard opened in 1901, adjacent to the refinery. The closure of the docks and the refinery in the 1970s enabled Swire’s to create Taikoo Shing, a large residential development, and Citiplaza, a commercial complex. 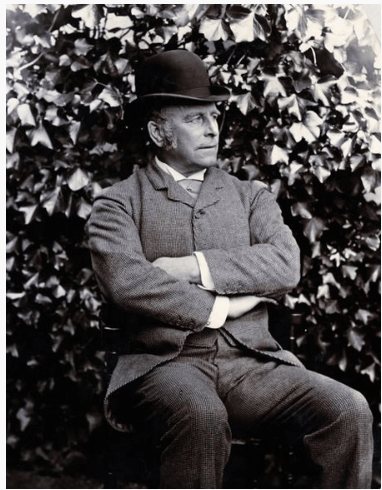 Referred to by his partners as ‘The Senior’, John Samuel, even from faraway London, took a close interest in his overseas businesses and employees and continued to visit the East. He was energetic and tenacious, forthright yet patient, except with the incompetence of others, and directed Swire’s with a broad vision while keeping a keen eye on the detail.When one of his managers wrote to him for permission to buy more furniture for his residence, John Samuel replied: ‘If you had half a dozen wives, and each prolific, you could not require more.’ He avoided any involvement in treaty port politics and advised his staff to do likewise, as these got in the way of pursuing the objectives of the business. In October 1881 he married again: with his second wife, Boston-born Mary Warren, daughter of a Liverpool shipowner, he had another son, George Warren. In 1884 he bought Leighton House in Bedfordshire, a residence suited to his successful status. There, The Senior was master of a large household, including 12 servants. Of these two were full-time nureses, since he suffered from rheumatoid arthritis in his later years. Until he died, in his London residence, of heart failure in 1898, he never once relinquished control of his business empire. 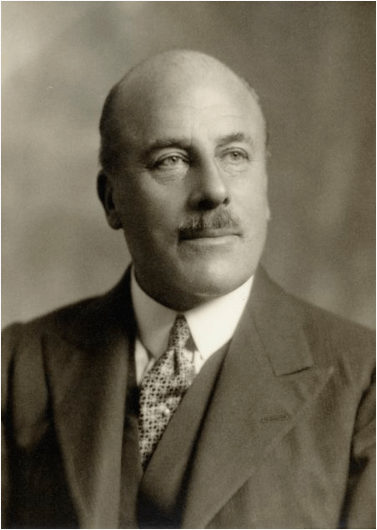 The immediate sucessors were James Scott, senior partner until 1912, and John Samuel’s eldest son, John (‘Jack’) Swire, who was chairman until 1927. In 1914 JS & S was turned into a limited company. George Warren Swire was made a full partner of JS& S at the age of 22. He had not been keen to join the firm but nevertheless took particular interest in shipping, turning China Navigation Company round from losses to profits. In 1914 he was posted to fight in Egypt with the prestigious Royal Bucks Hussars, but was recalled to London in 1916 to work for the government in the control of shipping. He was not sorry to leave the army; he said that he resented learning to obey incompetent fools who were not even gentlemen. He became chairman of JS & S in 1927 and held this post until 1946, showing himself to be very committed to China during this period of tremendous upheaval. Almost alone among British businessmen at that time, he developed relationships with Chinese political and business leaders and stressed the importance of employing more local staff and targeting local customers. Despite this, he had firm views on race and was pro-Nazi even after the outbreak of the Second World War. He considered himself a merchant adventurer of the old school and, despite a reputation for being abrupt and at times even rude, was widely respected by colleagues and competitors alike. He died suddenly of a heart attack, never having married. John Kidston Swire, known as ‘Jock’, elder son and second of the four children of Jack Swire, joined JS & S in 1913 and came out to Hong Kong. When war broke out in Europe, Jock Swire was posted to France, rising to the rank of major in the Essex Yeomanry. He was twice wounded and twice recommended for decoration; as a result of his wartime experiences he remained partially deaf for the rest of his life. In 1920 he was made director in charge of the firm’s overseas staff and he toured every facility they had in the Far East. Jock was forward-thinking, suggesting that female clerks be remunerated at the same rate as males. He also maintained that all recruits for the East should be graduates and should learn Chinese. During this time of revolutionary turmoil in China, Jock believed that British firms must adapt if they were to survive and that Chinese nationalism had to be accommodated rather than challenged. This article was first posted on 24th July 2018. We have a number of articles about the Taokoo Dockyard all of which are listed in our index. Wikiswire – WikiSwire is, and should always be, a work in progress. Our aim is for WikiSwire to become a regular stopping place for those who work for Swire, have worked for Swire or just have an interest in the group, its history and its operations. We want this to be a place where visitors not only find what interests them, but also a place where they can freely share new information, new stories and new images. We hope that WikiSwire will always be growing, evolving and offering something new. We hope to learn as much as we hope to inform.